Today was really hard, it hit 108 degrees and we all struggled to survive with two weak AC units in the trailer between the eight of us and a limited quantity of ice. We are going to have to get used to this because with climate change, the new normal is around 120 F degrees for the summer. 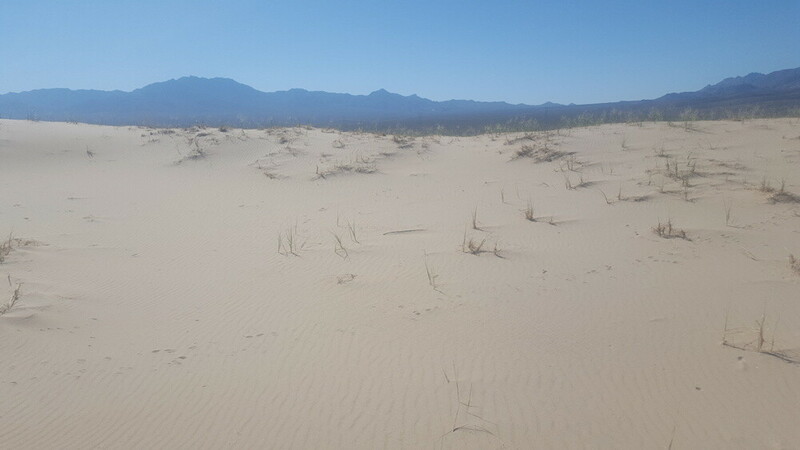 What was worse was we tried exploring the Mojave desert today, and we got to about the sand dunes and started collapsing, some people made it to the top of the dunes but most of us only got to the base. The amount of energy it expended to move our feet in the sand was incredible, we all got weak and tired quickly. As we continued to explore we stumbled upon a government building, it was closed for the day but it looked like it still operated. It appeared to be a train station or some sort of post. What was most notable was the grass, the grass was not only green, but it had been watered, and there were trees over the grass providing shade. We immediately flocked to the grass wanting to bask in its cooling effect. The combined effect of the shade from the trees and the wet grass brought the temperature a net ten degrees cooler. I, however, was not impressed by this grass, which was clearly a display of the power and privilege over us all by the government. We are living in a town that was abandoned because of the lack of drinking water, we have been put on a strict ration of four gallons of water a day, people around the world are dying from the lack of water and this government thinks it’s okay to waste probably 100 gallons a week if not more on some grass! It was this wasteful behavior that got us in this problem, and this green grass in the desert doesn’t just happen by wasting water, you have to add all sorts of chemicals to keep it alive. There are the pesticides to kill the weeds, the emissions burned to keep the grass cut, and then the fertilizer (more fossil fuel products) to keep it unnaturally green, all for this unnatural man made product called lawns. 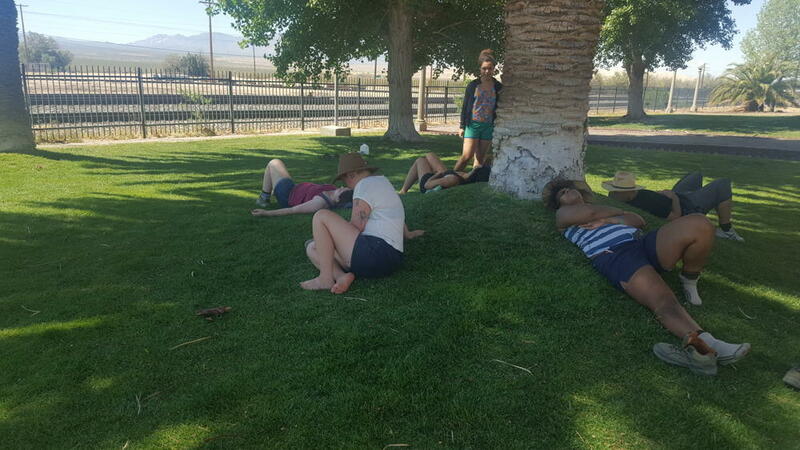 But the rest of our group loved it, even I enjoyed the shade and feel asleep on the grass. Still, lawns make me mad, they are such a sign of Western privilege, having the ability to waste resources to keep something alive that is unnecessary and the worst part is the really rich people do not even sit on their lawns they just make it green for people to stare at, but then they tell you not to step on the lawn as they waste water that could be used to feed my people back home. I understand the cooling effect lawns have the ability to create, I still do not think it’s worth the lawnmowing emissions, fertilizers and pesticides it takes to create this facade of an oasis in the desert, when humans probably shouldn’t be living here in the first place. When we got back to our place I was exhausted, the heat made me lethargic and weak, I could not even do anything. I retreated to my room and tried to rig up an old AC unit we found, it sucked so much power it turned off everyone else’s fan so that did not work either. Exhausted and out of ideas, I fell back into my bed and sat there too tired to even swat the flies that landed on me. I fell asleep but kept waking up because it was so hot and stuffy, at one point I took one of the limited pieces of ice and rubbed it all over me and then tried to go back to bed. It was awful. I was too hot, tired and weak to move, I couldn’t even get out of the bed for lunch, I was not even hungry until 8:30pm again when the sun went back down. I am not sure this place was ever made for people to live in. Indigenous people like the Mojave people may have found ways to survive in the desert without water, but Western society should never have been permitted to live in the desert. Not when they want to bring their lawns and pools with them. Powerful and straightforward points. An unnecessary luxury that cost the lives and well-being of others.